I have been looking for an opportunity to try out this neat spread sheet for creating scatterplots as an alternative to the standard bar graph as a way of presenting the results of a treatment trial. This week the American Journal of Speech-Language Pathology posted our manuscript “A randomized trial of twelve-week interventions for the treatment of developmental phonological disorder in francophone children”. 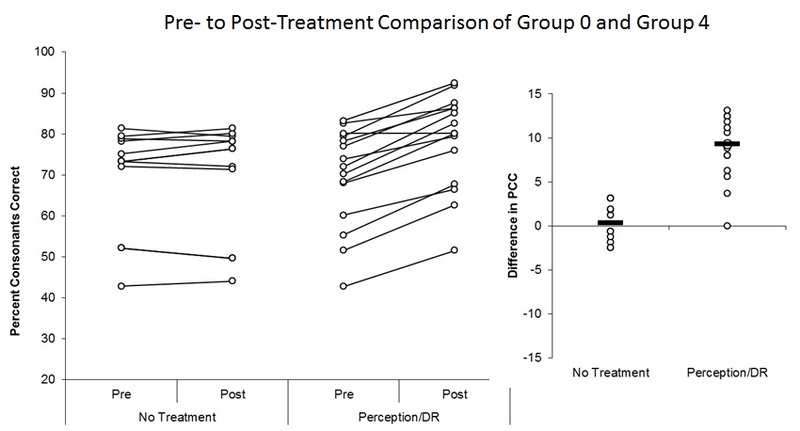 In the paper we compare outcomes (speech production accuracy and phonological awareness) for the four experimental groups in comparison to a no-treatment group using the standard bar graphs. Weissberger et al disparage this presentation as “visual tables” that mask distributional information. They provide a spreadsheet that allows the researcher to represent data so that the underlying individual scores can be seen. I am going to show some of the speech accuracy data from the new paper that Françoise and I have just published in this form. In our trial we treated 65 four-year-old francophone children. Each child received the same treatment components: 6 one hour individual therapy sessions targeting speech accuracy, delivered once per week in the first six weeks; followed by 6 one hour group therapy sessions targeting phonological awareness, delivered once per week in the second six weeks; simultaneously in the second six weeks, parents received a parent education program. The nature of the individual therapy and parent education programs was varied however with children randomly assigned to four possible combinations of intervention as follows: Group 1 (Output-oriented Individual Intervention and Articulation Practice Home Program); Group 2 (Output-oriented Individual Intervention and Dialogic Reading Home Program); Group 3 (Input-oriented Individual Intervention and Articulation Practice Home Program); Group 4 (Input-oriented Individual Intervention and Dialogic Reading Home Program). The Output Oriented Individual Intervention and the Articulation Practice Home Program components focused on speech production practice so this was a theoretically consistent combination. The Input Oriented Individual Intervention and the Dialogic Reading Home Program included procedures for providing high quality inputs that required the child to listen carefully to those inputs with no explicit focus on speech accuracy; the child might be required to make nonverbal responses or might choose to make verbal responses but adult feedback would be focused on the child’s meaning rather than on speech accuracy directly. This combination was also theoretically consistent. The remaining two combinations mix and match these components in a way that was not theoretically consistent. All four interventions were effective relative to the no-treatment control but the theoretically consistent combinations were the most effective. The results are shown in bar graphs in Figures 2 and 3 of the paper. Here I will represent the results for the two theoretically consistent conditions in comparison to the no-treatment control condition, using the Weissberger Paired Data Scatterplot Template to represent the pre- to post-treatment changes in Percent Consonants Correct (PCC) scores on our Test Francophone de Phonologie. 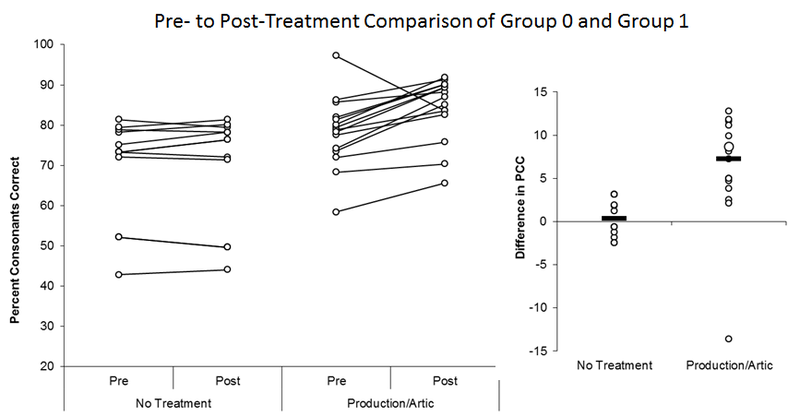 The first chart shows the data for the Input Output Oriented/Articulation Practice intervention (Group 1) compared to the no-treatment group (Group 0). You might be surprised by how high the scores are for some children pre-treatment; this is normal for French because expectations for consonant accuracy are higher in French than in English because consonants are mastered at an earlier age even although syllable structure errors persist and may not be mastered until first or second grade. The important observations are that the difference scores for the no-treatment group are tightly clustered around 0 whereas the difference scores in the treated group are spread out with the average (median) amount of change being 7 points higher than 0. Next I show the same comparison for the Output Input Oriented/Dialogic Reading intervention (Group 4) in comparison to Group 0. In this case the median of the difference scores is 9, slightly higher than for Group 1, possibly because the pretreatment scores are lower for this group. In any case, it is clear that a treatment effect is observed for both combinations of interventions which is striking because in one group the children practiced speech with direct feedback from the SLP and parent about their speech accuracy whereas in the other group direct speech practice and feedback about speech accuracy was minimal! Do these scatterplots provide any additional information relative to the traditional bar charts that are shown in the AJSLP paper? One thing that is clearer in this representation is that there are children in Group 1 and in Group 4 who did not respond to the treatment. Randomized control trials tell us about the effectiveness of interventions on average. They can help me as a researcher suggest general principles (such as, given a short treatment interval, a theoretically consistent intervention is probably better than an “eclectic” one). As a speech-language pathologist however you must make the best choice of treatment approach for each individual child that walks into your treatment room. Providing an evidence base to support those decisions requires access to large research grants for very very large multi-site trials. There is only so much we can learn from small trials like this. I hope that you will check out the actual paper however which includes as supplemental information our complete procedure manual with a description of all target selection and treatment procedures, equally applicable to English and French.